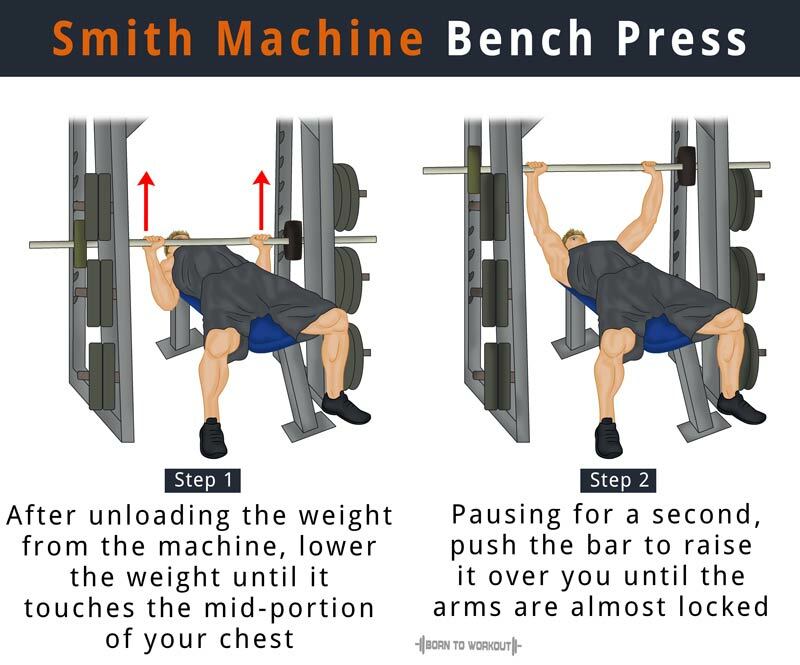 As compared to traditional flat bench barbell bench press, the smith machine variety uses lighter weights and thus allows the bar to slide up and down easily. Therefore, the inexperienced or casual gym goers can safely perform the bench press involving higher weights. It is usually performed as part of a muscle-toning exercise routine and can be complemented with free weight exercises like decline barbell bench press, incline dumbbell flys, dumbbell pullovers, etc. Using smith machine for bench press helps beginners by allowing them to adapt to the range of movement. Keep a flat bench under the smith machine with the bar placed at a suitable height so that you do not have any problem in reaching the bar and extending your arms when lying down. Once you select the desired weight, lie down on the bench. Use a pronated grip wider than your shoulder width and unload the weight from the machine to raise it over you until your arms are almost locked. It is the starting position. Lower the weight gradually until it touches the mid-portion of your chest. After pausing for a second, push the bar with your chest muscles to press it back to the initial position. Come down slowly again after holding the contracted position for a second. Perform the desired number of repetitions and after completing the reps load the weight back onto the rack. The exercise can also be performed by placing an incline or decline bench under the smith machine, or by holding the weight using a closer grip than your shoulder width. These variations will not only target your chest muscles but also put greater emphasis on your front shoulder muscles. Make sure the rep timing is slow by controlling the movement throughout the sets. Do not let the weight bounce off the chest. If you are a beginner, use a spotter to help you unload the weight from the rack. Squeeze the chest after pressing to the top of the movement.